Every time we get creative with Project: Around the World, I realize just how valuable it is. We learn a little, ask questions, wonder, and expand our world. And with the state of the world lately, we need to expand our world beyond our own neighborhood. Our latest project was inspired by the island nation of Barbados. While there are many beautiful and fascinating things about the country (read all about it here), we found our inspiration in their production of sugar cane. Sugar played a very important role in the economic growth of the country. So, we concocted our own DIY sugar paint and let ourselves be inspired by the Caribbean nation of Barbados. Disclosure: This post contains Amazon Affiliate links. Please see my Disclosure Page for more details. 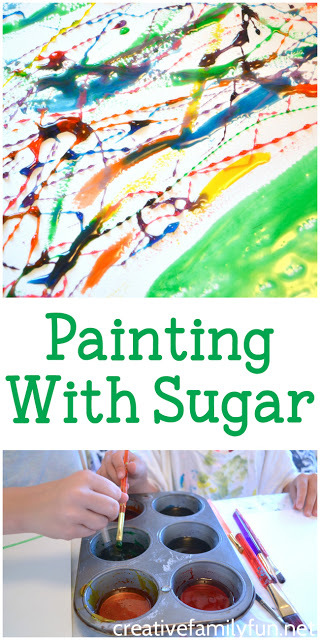 In order to paint with sugar, we needed a liquid form of sugar. Light corn syrup was the first thing that popped in my head. I had remembered seeing other versions of DIY paint that used corn syrup, so I thought we’d give it a try. I took a trip to the grocery store for supplies. The only thing I’ve ever used light corn syrup in was pecan pie and I’ve only made that a few times in my life. I never have corn syrup in my pantry. Other than the corn syrup, I only needed one other item: food coloring. 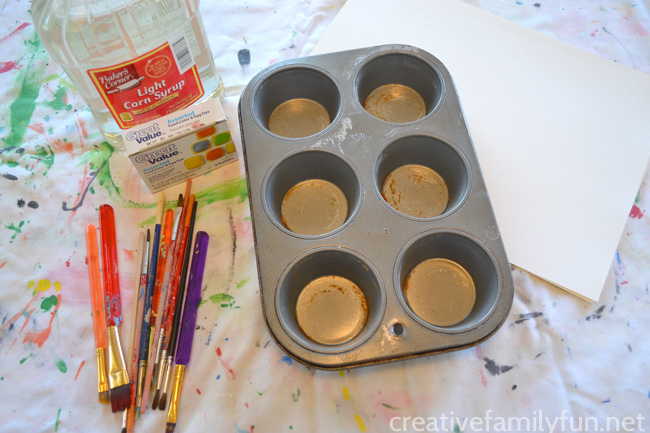 You’ll need a muffin tin (this makes for easy clean up), light corn syrup, and food coloring. Add one to two tablespoons of corn syrup to each muffin cup. Exact measurements are not really that important, just eyeball it. 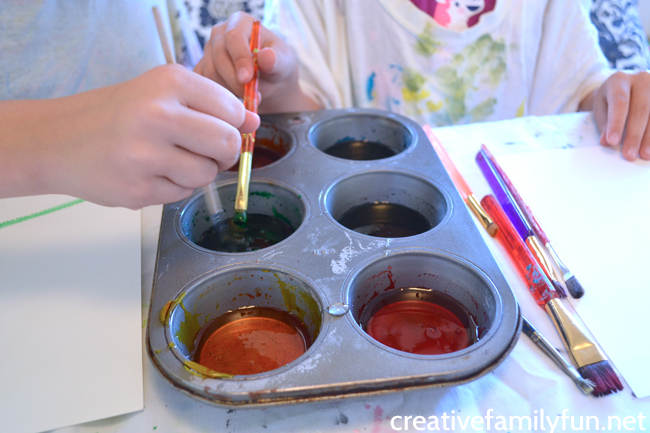 For two children, we didn’t use much paint, one tablespoon in each cup would have been enough. Add five to six drops of food coloring to each cup. The more food coloring you use, the brighter the color. Mix each with a spoon. Now you’re ready to paint. Clean Up Hint: Our paint brushes cleaned easily with a little mild soap and water. I used a bit of dish soap when I cleaned up. Once we made the paint, we were ready to create. 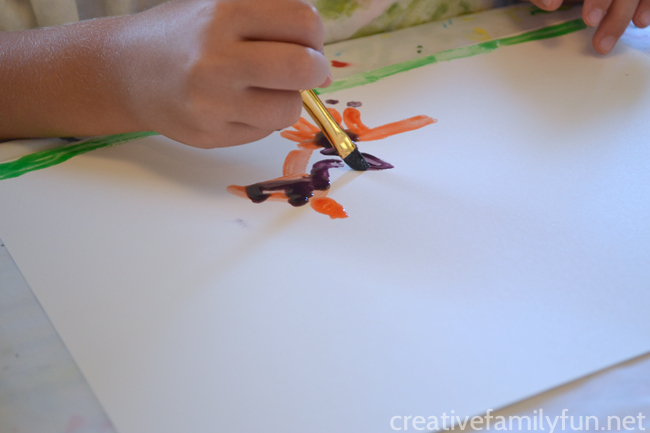 We used our regular paint brushes and white drawing paper for our picture. You won’t want to use thin paper, but anything as thick as white copy paper will be fine. While we painted, we learned about Barbados. Barbados is tiny. It’s only 167 square miles in size with a population of just over 284,000. It’s home to four different nesting turtle species: the loggerhead, green turtle, hawksbill turtle, and leatherback. Cricket is the most popular sport. Like many other Caribbean nations, tourism plays an important role in its economy. While we talked, we painted. 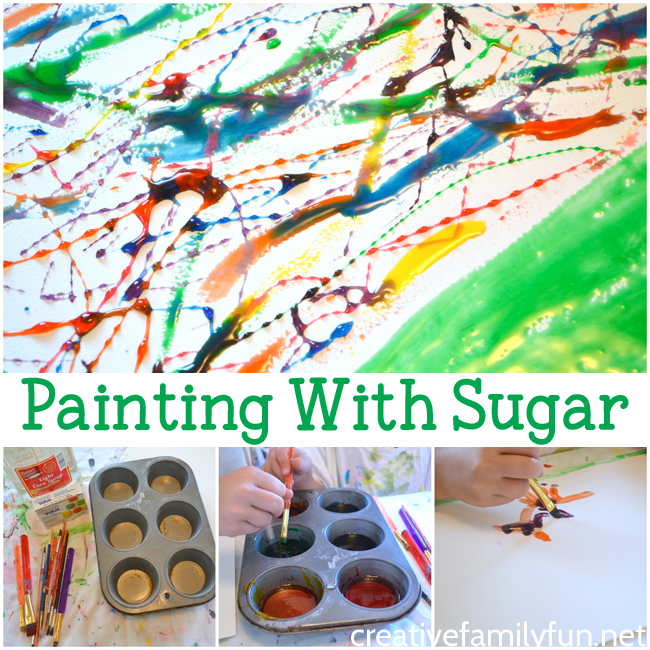 We leaned that our sugar paint was a little bit harder to use than our favorite type of paint – watercolors. The paint was thick and sticky. We quickly learned to adapt. It was hard to make long sweeping lines, so we stuck with shorter lines. It took more time to fill in a large area, so we had to go slowly. 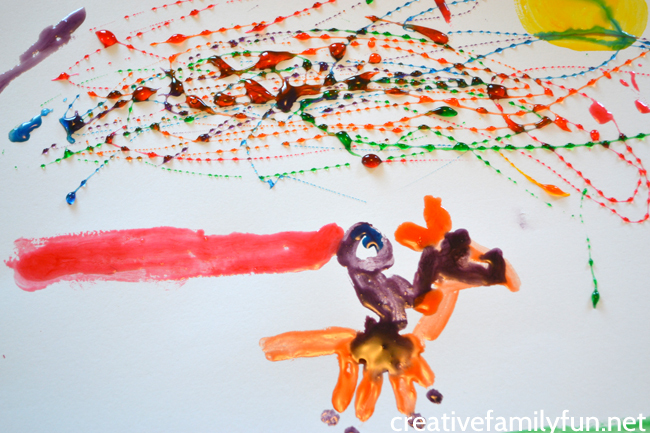 We veered off from creating actual pictures when my oldest daughter discovered what happened when you dripped the paint on your paper. The paint didn’t run. It stayed in droplets. Cool! 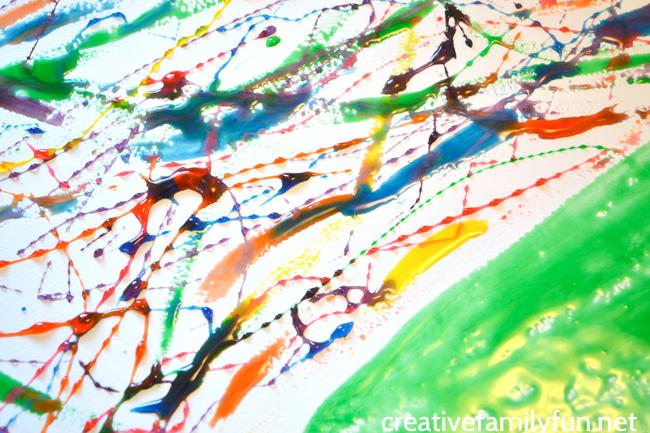 Soon our creations turned into awesome abstract pictures using drip painting. It’s so much fun to create with a new medium. Especially when that new medium is linked to a fun geography lesson. We learned about sugar and about Barbados all while creating beautiful artwork. Now, I just have to figure out what to do with the rest of the corn syrup! Special note: Make sure you take picture of the completed artwork. The paint did dry, but remained sticky. I wouldn’t recommend keeping the completed projects for too long. Photography is a great way to keep artwork without the paper clutter (or in this case, sticky paper). 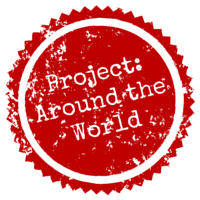 Find all the Project: Around the World posts here.